Through a solid commitment to research and development, we have applied our expertise to produce the most complete line of enclosed track workstation crane and monorail systems from one manufacturer in the world. Available in aluminum, steel, and stainless steel, these overhead conveyance rails form the backbone for any material handling system. IR Zimmerman rails are available in three different materials and five different sizes to meet your specific material handling needs. The Enclosed Rail Systems design reduces the accumulation of dirt and grime on the internal rolling surfaces, thus reducing rolling effort. IR Zimmerman’s primary and vital concern is safety. Deflection: IR Zimmerman rail is designed to not exceed 1/450 of span, in accordance with ANSI B30.11 Monorail and Underhung Cranes. Safety Cables: We require the use of safety cables at all moving (hanger and end-truck) suspension points. Redundant End Stops: Available for extra safety. Load Ratings: Clearly marked on both sides of bridge rails. Safety Factor: All hardware components are rated at a 5 to 1 safety factor based on meticulous tests performed at independent testing laboratories. We offer a wide variety of hangers to attach to virtually any type of overhead steel. Available in either rigid (anti-compression) or pivoting styles to match the material handling operation, the hangers are available in fixed and adjustable lengths for all rails. For extra safety, We require that all hangers with a drop of 24 inches or greater have sway/thrust bracing for stability. While we offer both articulating and rigid end trucks to match the material handling application, the primary system sold utilizes the articulating end truck. This feature maximizes the ability of the operator to precisely position loads by allowing them to move only the portion of the bridge crane near the load. This results in dramatic improvements over typical rigid end truck systems which require the user to move the entire mass of the bridge crane for each operation. 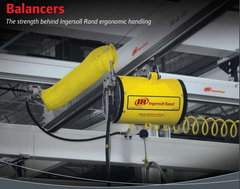 IR Zimmerman trolleys are designed to work in conjunction with the Enclosed Track Rail to reduce the rolling effort required to move a load. In fact, only a force equal to one percent of the total rolling weight is needed when moving loads. Lightweight: Trolleys are primarily made from high-strength Almag castings. Also available in steel and stainless steel stampings. Injection Molded Wheels: Provide for clean, wear-free operation that resists flattening. Sealed Precision Bearings: In wheels and side guide rollers, they provide long life and reduced maintenance. Rail Safety Lug: Prevents the body of the trolley from being pulled through the enclosed track rail. Versatile: Zimmerman-built trolleys are available for use in virtually every manufacturer’s enclosed track rail system. Zimmerman offers both standard and custom free standing floor supported systems. These systems allow for the placement of workstation rail systems independent of existing overhead structural steel. Air supply: Kits are available in both 3/8" and 1/2". Kits are available with a filter/regulator for use with Balancers and manipulator systems. We also supply air supply kits without the filter/regulator for use with oil-based pneumatic systems such as hoists and tractor drives. Electrical supply: Kits are available to supplement virtually any type of electrical equipment. Insul-8 electrification systems are available. A wide range of accessories such as curved rail, track switches, bridge extensions, and custom designed components are available to enhance any crane or monorail system.